A meeting of 20-30 men took place in early May 1849 and it was decided to form Eccleshall Cricket Club. On the 5th May they played Cotes Heath & Standon and lost their first ever match. It was Mr.C.E. Lyon of Johnson Hall who was instrumental in the foundation of the early club. He was a Cambridge Blue and played cricket for Staffordshire. A number of Clergy played in the early sides including the Rev. Vernon Yonge. The early home matches were played “on land lent by the church” and this land could be the site of the current ground. Grounds were not prepared as they are today and often took place home and away over two weekends. Scores of 40 and 25 were normal for two innings. By 1851, the Club was established on land off Cross Butts (owned by the Lyon family) and were playing Victoria CC of Stoke-on-Trent, Trentham CC, Stafford Wednesday, Whitmore, Stafford Institute and Birmingham Arcadians. The Cricket Field is shown on a map of Eccleshall of 1879 along with a flagpole. At some point, the Club moved to the field opposite the Newport Road entrance of Johnson Hall. Other names that featured; Rev. CH Long, Norris, Bennion, Steedon, Edwards, Hopkins, Sherrod W, Sherrod J, Dempster and Glennie. The Club had to move again in 1905-10 due to the building of an underground water reservoir. Cricket was then played in the field the town side of Fletcher’s Garden Centre and then in the field opposite Chester Lodge. Little is known of the period from 1910-1939. 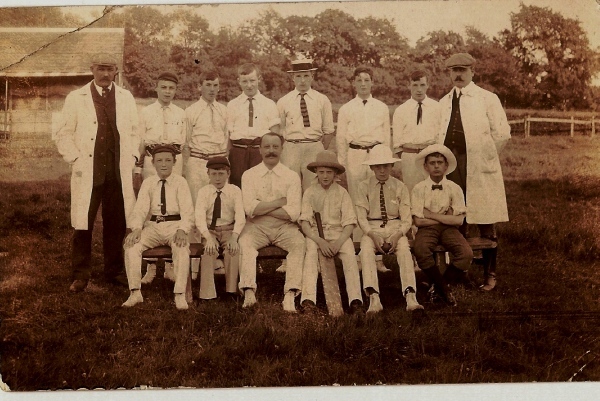 After the 2nd World War, cricket does not seem to be a priority, until in 1959/1960 when Mr. Mark Carter of Eccleshall Castle and Dr.Ross Harrison founded the current version of the Club. The square was laid by En Tout Cas and the pavilion was bought from ROF Swynnerton for £50. This was taken down and erected at the club in 1961. Not many games were played in 1960 and they were all away from home due to the square not being established. The club continued to play friendly cricket and was able to form a 2nd XI in the early 1970s with there was an input of youngsters from Graham Balfour and Kind Edward VI GS. The first junior U18 side started in c1971 and was the only entry into junior cricket for many years. In 1979, the Club made their first foray into League Cricket with the formation of the South Cheshire Alliance. Both sides won their league in 1983. The Club also spent many years in the North Staffs &District League before it made the leap into the North Staffs &South Cheshire Premier League. Today the 1st XI is in Division 2 and runs 6 Junior Teams-the rest is on the website.